At the peak of its economic prosperity, Japan had the highest human productivity in the world. Today it is in the 7th position – even though the average Japanese works 80 hours a week and 100 hours a week is not uncommon. Japan ranks at the bottom among countries on the vacation dimension. Unfortunately, there is no relationship between hours worked and performance. In a desperate attempt to encourage people to spend a little time away from work, Japan introduced a “Friday Premium” program under which employees were required to leave their workplace at 3 PM on the last Friday of every month. The result? Nothing. In a culture that places the welfare of the group far ahead of the individual, no one wanted to be the first to leave. Contrast this with countries that literally force people to work no more than 30 – 35 hours a week. Has anything changed in these countries? Nothing, again. If you are wondering why we see so much of chaos and confusion around us today (despite Professor Steven Pinker’s argument to the contrary) the answer appears to be “complicatedness” – a term coined by the Boston Consulting Group. Complicatedness refers to the increase in organizational structures, processes, decision rights, metrics, score cards, and committees that organizations impose to manage the escalating complexity of their external business environment. Most organizations react to the complexity in the external environment by increasing the complexity within the organization. A simple product quality problem can easily be morphed into the addition of a separate quality function, more rules, standardization, and governance mechanisms that ensure no decision is ever made on time. The reality is of course that simplicity invariably wins. The “less complicated” organizations achieve revenue growth and profit margins that are above industry average and far above their “complicated peers.” Complicatedness hampers growth by slowing innovation and the deployment of new products and services. Complicatedness also cuts margins by injecting inefficiency and costs into operations. 1. Company size has no relationship with complicatedness. The smallest companies can be as complex as large organizations if the systems, cultures, and processes come in the way of agility and flexibility. 2. Complicatedness varies with industry. Highly regulated industries (health care) tend to be more complicated than less regulated industries (technology). 3. Most surprisingly, the perception of complicatedness is directly related to the level of managerial responsibility. Employees with no managerial responsibility have a 70% higher score on complicatedness than that of the board of directors. I urge you to allow that last strand to sink in for a moment. What the research is pointing out is that leadership and complicatedness go hand in hand. Leaders typically don’t need to live by the many rules and procedures they create and instead can work outside the systems that apply to their employees. Many leaders believe they are very good at reducing complicatedness. 1 Identify perceptions of complicatedness at all levels through a fair and transparent process. 2 Diagnose the root causes of complicatedness and unproductive behavior. 3 Design pilot solutions that simplify processes and are perceived to be simpler and better by employees. 4. Implement the solution throughout the organization. 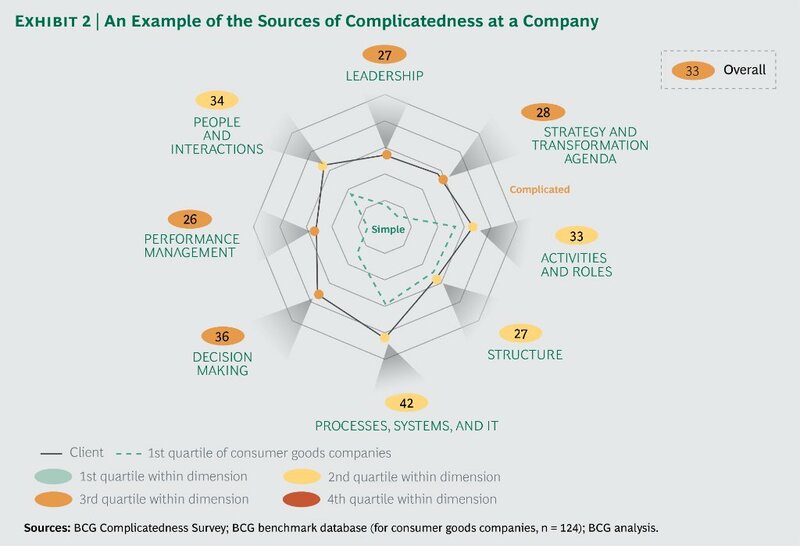 For more on complicatedness and to take the complicatedness survey, please visit the Boston Consulting Group’s Website and read the latest “perspectives” column.